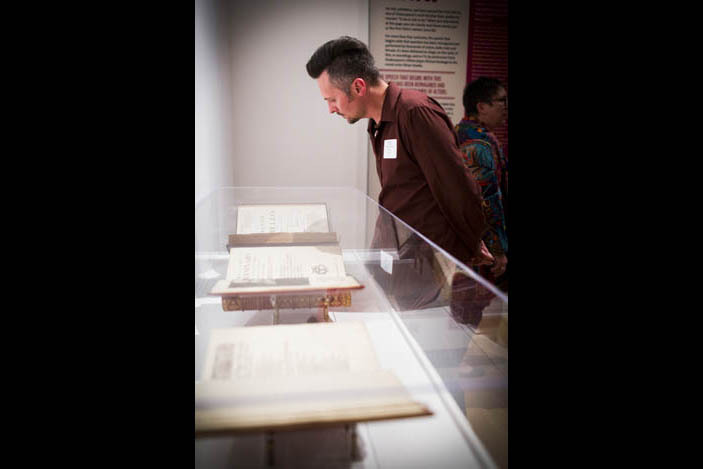 "First Folio: The Book that Gave Us Shakespeare" is on display through Dec. 11 at the Carlos Museum. The First Folio, published in 1623, is the centerpiece of the exhibit and is open to the "To be or not to be" soliloquy from "Hamlet." Emory is the only Georgia site for the First Folio exhibit, which is touring the nation in honor of the 400th anniversary of Shakespeare's death. Emory's exhibit also includes Shakepeare's Second, Third and Fourth Folios. Throughout the exhibit space, vibrant panels explore Shakespeare's relevance to contemporary language, art and more. At a Nov. 4 preview event, Emory President Claire E. Sterk welcomed visitors to the First Folio exhibit, along with Rosemary Magee, director of the Rose Library, and English professor Sheila Cavanagh, director of the World Shakespeare Project. 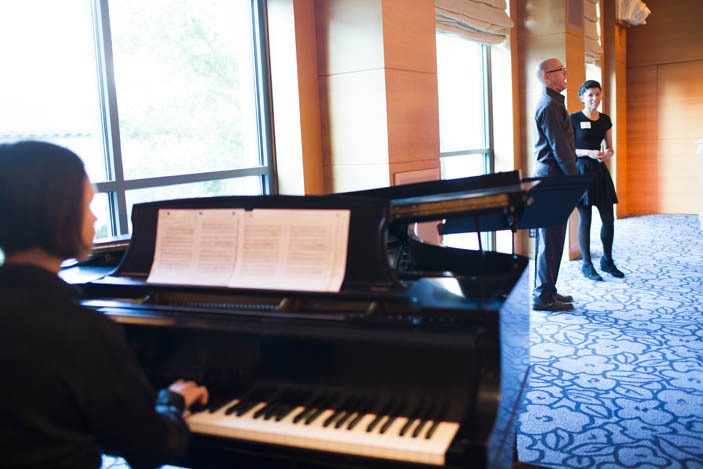 The gala preview event also included musical performances based on Shakespeare's works. 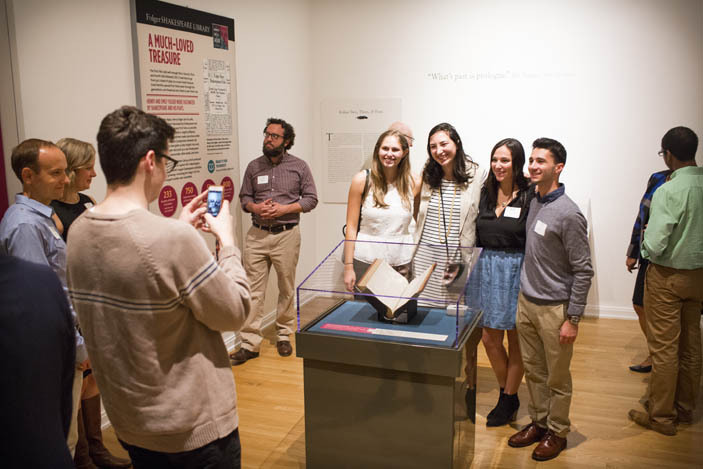 A celebratory crowd gathered at the Carlos Museum on Friday evening, Nov. 4, for a first look at the First Folio exhibit, which opened to the public Saturday and remains on display through Dec. 11. "What's past is prologue" reads the quote from William Shakespeare's play "The Tempest" emblazoned on the wall of the gallery in Emory's Michael C. Carlos Museum where the First Folio is now on view. It's a fitting epigraph for an exhibit focused on an almost 400-year-old book that remains remarkably relevant today. 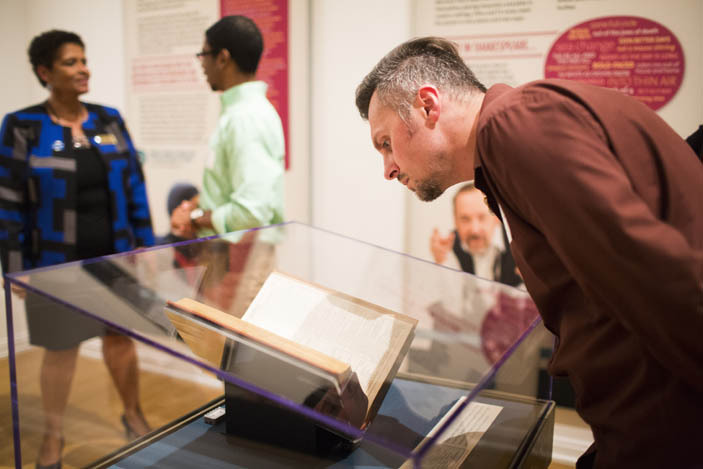 After more than a year of planning, "First Folio: The Book that Gave Us Shakespeare" opened to the public Saturday, drawing a steady flow of visitors throughout the weekend. At a special event the night before, the mood was both celebratory and reverent in the museum's Works on Paper gallery, where attendees got a first look at the exhibit, which continues through Dec. 11. "Friends, Georgians and colleagues, lend me your ears. 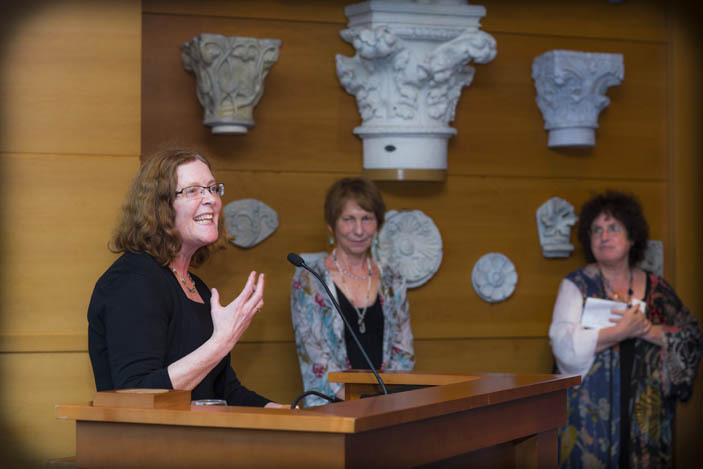 We come to praise Shakespeare and to honor him," Rosemary Magee, director of Emory's Rose Library, said as she welcomed guests to the event with remarks based on the famed speech in Shakespeare's "Julius Caesar." "The good that we do lives after us, oft embedded in our books," Magee said. "So be it with Shakespeare." Emory is the only Georgia site chosen to display the literary treasure as part of a national traveling exhibit from the Folger Shakespeare Library, which is coordinating displays in all 50 states to commemorate the 400th anniversary of the Bard's death. Emory is also one of only a few sites to concurrently display the Second (1632), Third (1663) and Fourth Folios (1685), made possible by a loan of the Second and Third folios from Rose Library benefactor Stuart A. Rose. "Joining the Second, Third and Fourth Folios here, we have a campus wide exploration and celebration of the First," Magee reminded attendees. "Inviting all from across Emory, the city and state, this is indeed much ado about something very special." 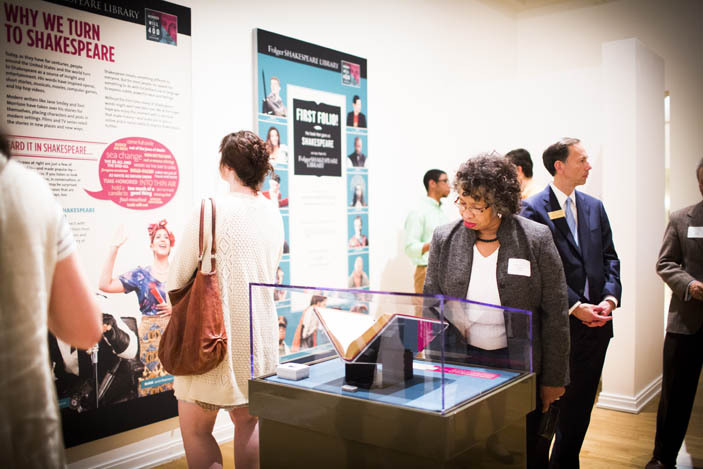 Having the opportunity to view the First Folio is a "once in a lifetime moment" that Emory is sharing across the university and into the broader community, President Claire E. Sterk told the opening reception. "Emory is indeed very proud to be chosen as the only site in Georgia to host the First Folio, and we have engaged the entire campus in this celebration," Sterk said. "Students, faculty, staff and alumni from across the campus and disciplines will host many events associated with the exhibition." In the center of the Works on Paper gallery, the First Folio stands alone in a glass case, open to the iconic "To be or not to be" soliloquy from "Hamlet." On the back wall, beneath the quote from "The Tempest," another case holds the copies of the Second, Third and Fourth Folios, each opened to a different page. But while the rare, centuries-old books are the focus, the exhibit was clearly designed for modern appeal. 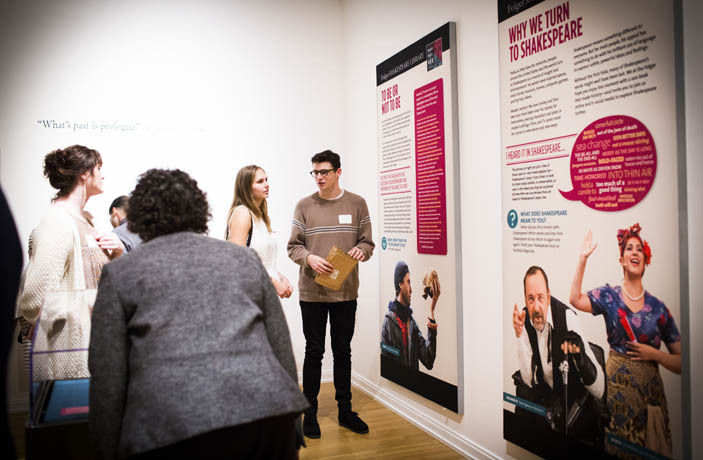 Panels lining the walls provide background on the First Folio and highlight Shakespeare's relevance to contemporary times. "Shakespeare's words are your words," proclaims the first, giving examples of phrases from the Bard's plays that remain in modern usage, like "Beware the ides of March," "We band of brothers" and "Brevity is the soul of wit." Other panels explore the history of the First Folio and the influence of Shakespeare on everything from contemporary literature to computer games and hip-hop music. All feature the familiar faces of famous actors playing Shakespearean roles, including Meryl Streep in "The Taming of the Shrew," Laurence Fishburne in "Othello," John Leguizamo in "Romeo and Juliet" and James Earl Jones in "Much Ado About Nothing." "Shakespeare is still having an impact on our culture 400 years later and that is quite remarkable," Sterk said at the reception. "We live in such a fast-moving world that we sometimes forget how special that is." Emory English professor Sheila Cavanagh, director of the World Shakespeare Project, noted in her remarks that creating the First Folio was risky at the time, as plays were not considered to be of as much literary value as poetry. "To give you some idea about the First Folio and why it matters: If it weren’t for the First Folio, we would not have 18 of Shakespeare's plays, and these include plays like 'Julius Caesar,' 'Twelfth Night,' 'Macbeth' and many more," she explained. Cavanagh also echoed Sterk's invitation for the entire community to join in Emory's celebration of the First Folio. Theater Emory presents "Romeo and Juliet" through Nov. 13. A series of staged readings examines interpretations of the Bard's work. Remaining events include "Fortunes of the Moor," a new vision of Shakespeare's "Othello," on Nov. 9; and "The Book of Will," Emory alumna Lauren Gunderson's play about the co-editors of the First Folio, on Nov. 13. Also on Dec. 5, the official closing celebration, "The Bard and Poetry," features former U.S. Poet Laureate Natasha Trethewey, Robert W. Woodruff Professor of English and Creative Writing, and award-winning poets and Emory professors Kevin Young and Jericho Brown.